This over view of the subject analyzes automotive cybersecurity threats that are gaining attention worldwide and the apparent ways industries are responding to them. It also addresses the need to continue investment in cyber research and security, as well as the ‘security by design’ approach that automakers are likely to adopt as a long-term strategy to fend off cyber-attacks. 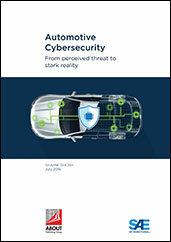 If you do not have access to SAE MOBILUS via username/password or institutional access, you can still purchase the Book, Automotive Cybersecurity: From Perceived Threat to Stark Reality.